Coverage: Data Governance Solutions Ltd are a specialist company focused on providing expertise in Intelligent Data Management and Security. They work with companies throughout the UK including IBM. 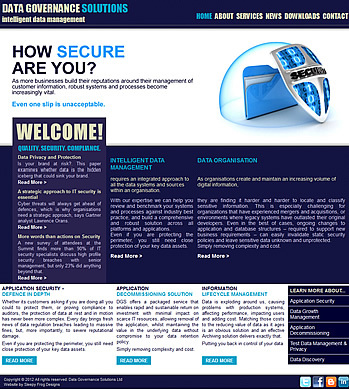 Specification: Data Governance Solutions required a clean and easy to maintain website to showcase the various data management and security services they offer. They also wished to manage the news area themselves, so a custom password protected admin area was provided.